Gourds with freshly mounted heads. 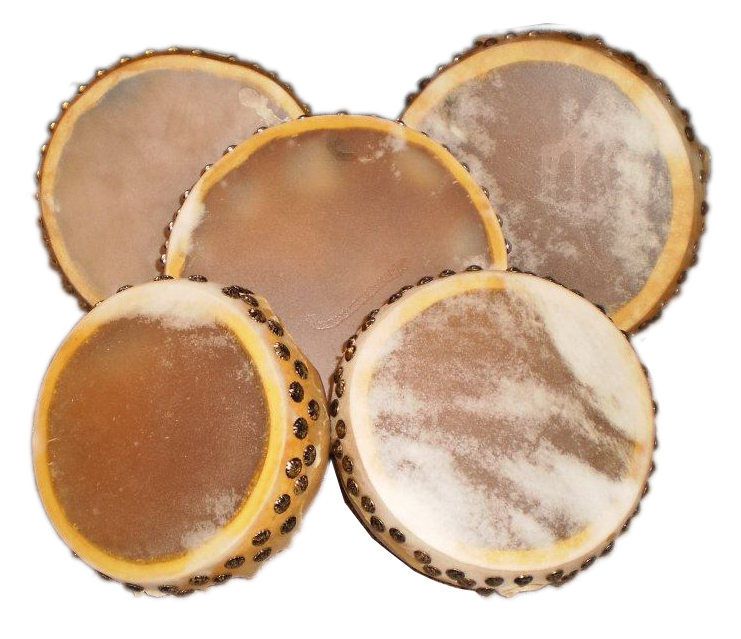 Gourd banjo heads are typically made from natural animal hides. Goat and calf hides are the most favored and easiest to come by. 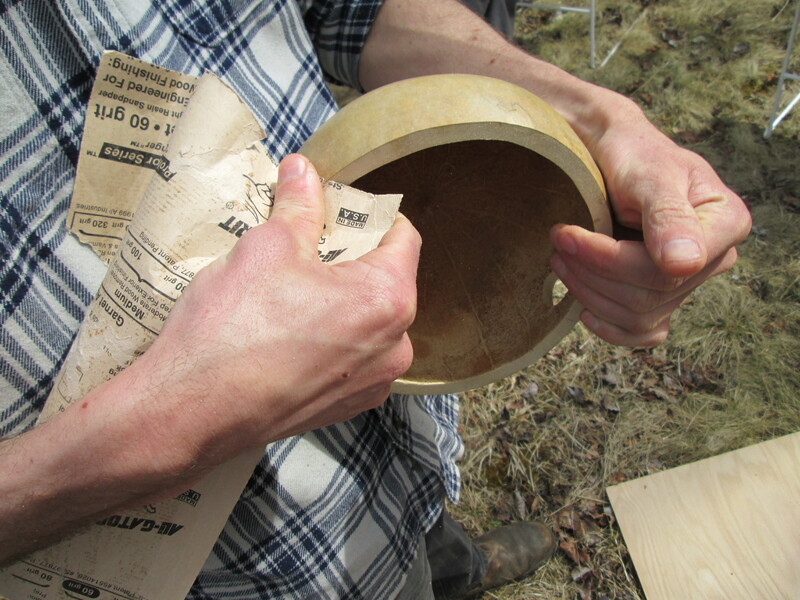 Mounting a natural hide head is fairly simple, but does require some time and hand strength. The head will be stretched as it is mounted. Then, as it dries it will shrink and become tight on the gourd. I use wood glue to fix the head to the gourd permanently. Tacks are used to hold the head in place until the glue dries. I always leave the tacks in place as decoration, but they could be removed because the glue does all the work. 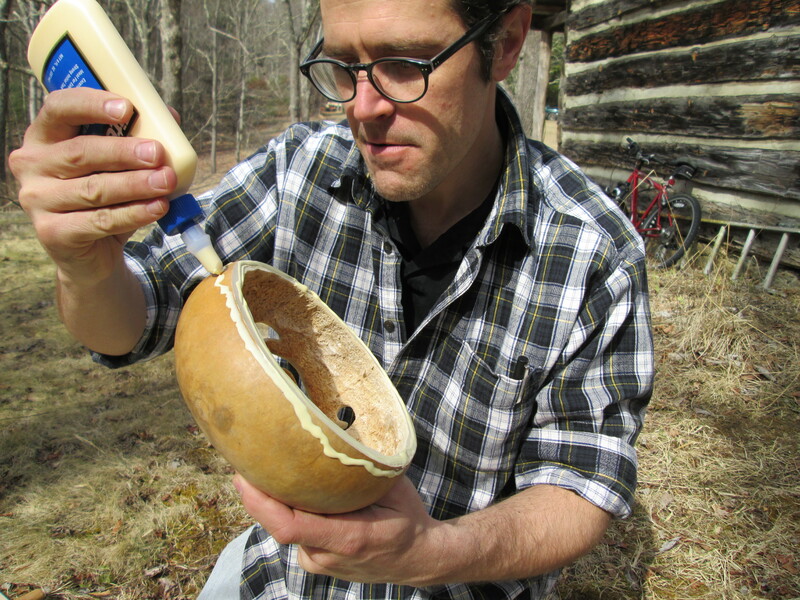 In order to make a strong bond with the surface of the gourd the head and the glue will need something to hold onto. The head will be glued to the top edge and the sides of the gourd. Make sure the top edge of the gourd is flat. Use sandpaper to remove any rough edges. 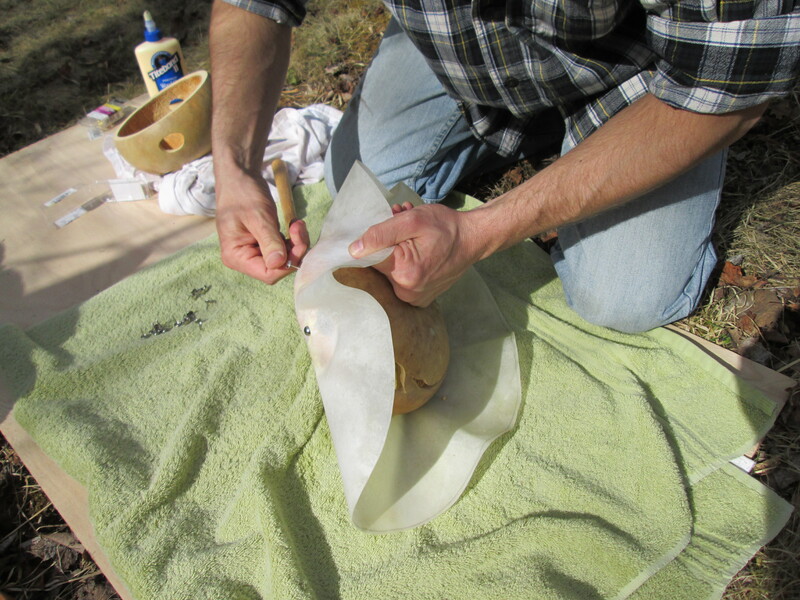 Use the sandpaper to rough up the side of the gourd for about an inch just below the top edge of the gourd. 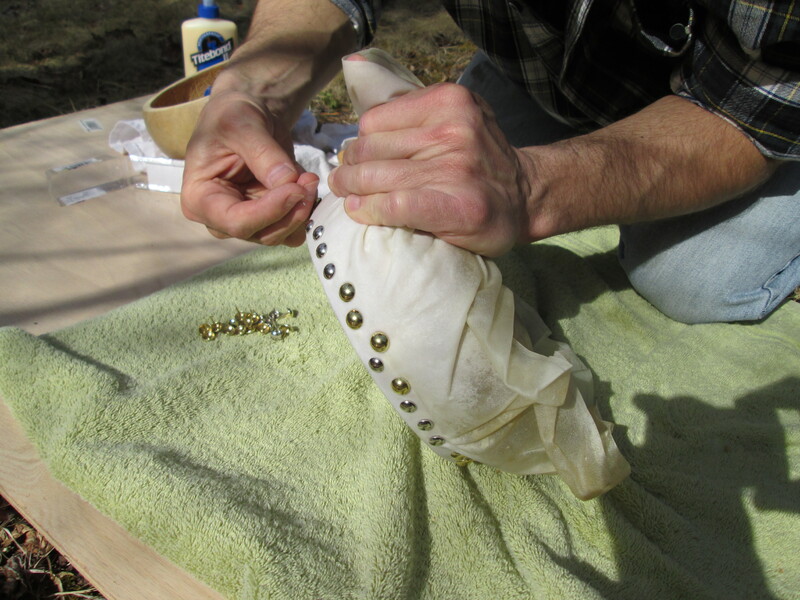 The head will drape over the edges of the gourd and be tacked to the side with furniture tacks. Prepare the gourd before mounting the head. Use luke-warm water to soak the head. Let it soak for 10 to 15 minutes. Make sure that it is completely submerged. I usually soak them in a sink or tub of plain tap water. When it has soaked long enough, the head will be very floppy and you should be able to stretch it a little. After removing from the sink I place the head on a towel and pat it dry. In order to keep it wet, I roll it up in a damp towel until I am ready to put it on the gourd. 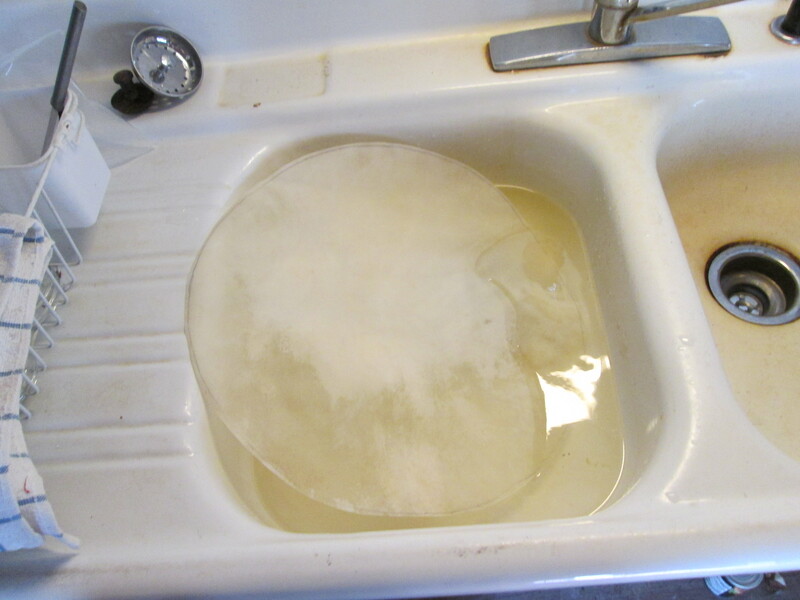 Soaking the head in the sink prior to mounting. Apply a thick layer of glue to the top edge and the side of the gourd. Spread it out into an even layer. 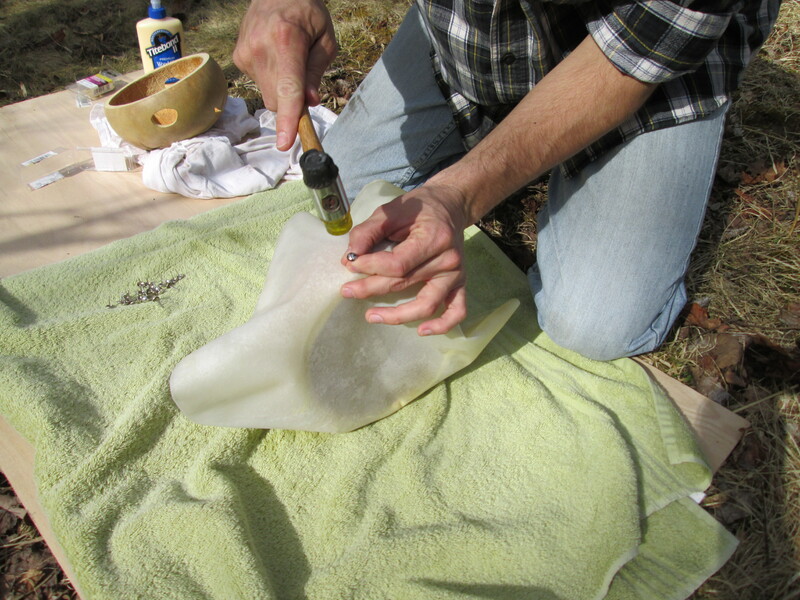 Applying glue to the side of the gourd. 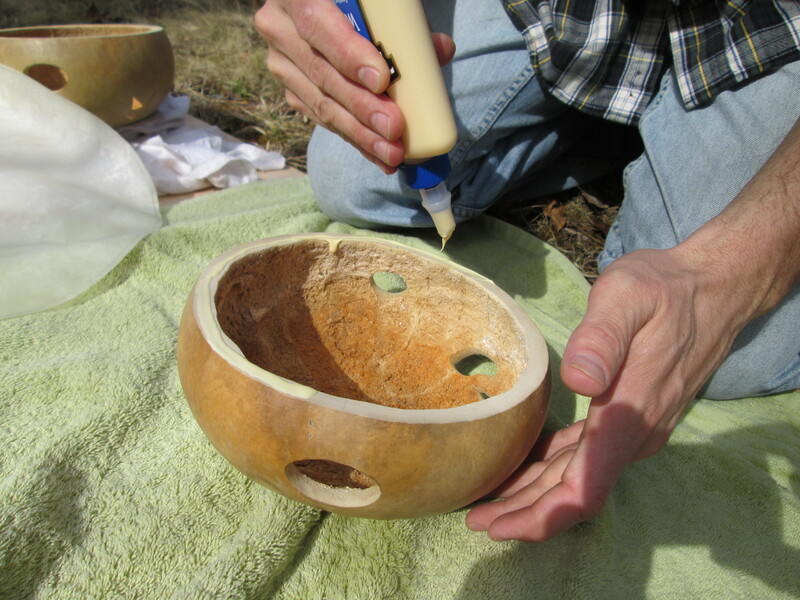 Applying glue to the top edge of the gourd. I like to work on the ground or in the floor for this part of the job because I can get more leverage when stretching the head. Place the towel on a solid surface. Roll out the head on the towel. Spread it out as flat as possible, then, sit the gourd on it. Keep the towel under the work area to act as padding. Use some tacks to fix the “four corners” of the head to the gourd. Thumb pressure may be enough to get the tacks started. Use the hammer to make them more secure if need be. You may wish to remove these tacks latter if they seem out of order with the permanent tacks. 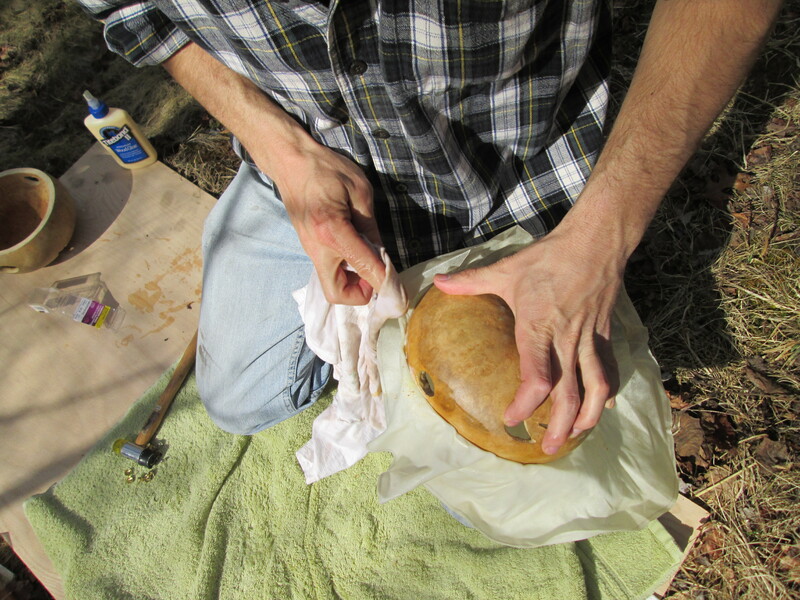 Superficially attaching the head to the gourd. With the gourd still on the towel, use leverage to stretch the head by holding the gourd against the work surface and pulling on the hide. Roll your knuckles under the edge of the head to create leverage on the side that is not against the work surface. Keep pulling and adding tacks until you are satisfied. Some glue may have smooshed out from under the edge of the head. Use a damp rag to wipe it away. Wipe away extra glue with a damp rag. A razor blade, pocket knife, or box cutter does this job pretty well. It’s best to go ahead and do this job while the head is still damp and pliable. Take care not to trim too close or poke the stretched part of the head. Set the gourd aside and allow the head to dry overnight. DO NOT THUMP THE HEAD UNTIL COMPLETELY DRY!